Music festivals have long been popular events among young, active individuals, and advertisers have been using them to put their brands in front of massive crowds. In recent years, music festivals have become something more than just about music. Some events even incorporate yoga lessons and bring in speakers for the attendees. This is what the Essence Music Festival has grown to become, too, even though it originally started as a celebration of the 25th anniversary of the launch of Essence Magazine. At more than 5000,000 attendees, the Essence Music Festival has evolved as the largest event for minority men and women to connect, experience and celebrate African-American art, culture, fashion and entrepreneurship. This target demographic is the exact audience our client, Mielle Organics, was looking to reach. The 2018 festival extended through four days, July 5–8, in New Orleans, inside the Mercedes-Benz Superdome, and included other events throughout the city. The festival brought visitors from all over the country for the extended weekend, and it served as an excellent opportunity for attendees to explore New Orleans. Mielle Organics wanted to gain valuable impressions, amplify its message and create a larger brand presence at the festival. They utilized a mobile billboard and taxi tops that drove around downtown New Orleans, and had a pop-up shop activation. The combination of these media and engagement tactics built interest with event attendees moving around the market. They provided an opportunity for the brand to gain exposure with potential customers in different ways. 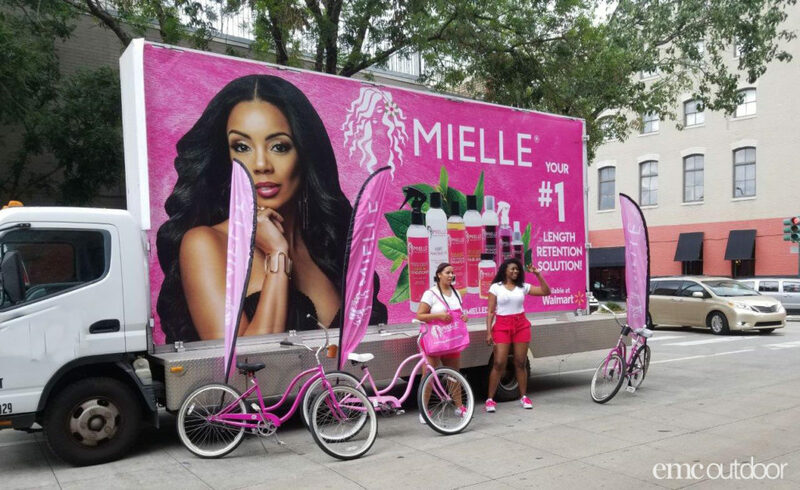 The mobile billboard and taxi tops drove avenues around the Ernest N. Morial Convention Center, the Mielle Organics pop up shop and the Superdome. This helped generate key impressions and build brand awareness for people walking, driving and taking public transportation throughout the market. The mobile billboard traveled more than 18 miles over four days. It hit their target impressions and created a larger, more impactful presence than predicted. The taxi tops help reinforce the message by reaching people along the taxi routes over the course of the event. The pop-up shop served as a supplemental experience to the mobile billboard. It allowed Mielle Organics to engage one-on-one with passersby and generate interest in their products with potential customers. Let our team of Out of Home strategists help your brand reach the right audience the right way. Contact us using the form below! September 7, 2018 | Filed under Daily Updates, Featured, Mobile Billboards, Non-traditional Media, Pop-up Shop, Taxi Advertising, Traditional Media and tagged with beauty, convention, event, festival, mobile billboard, New Orleans, out of home, out of home advertising, outdoor advertising, pop-up shop, taxi advertising, taxi tops.